The Hahn & Clay patented finger-pin closure functions efficiently using the principle of tapered fingers interlocked with radial tapered pins. The tapered fingers and pins provide for rapid and efficient assembly or disassembly of any machinable closure. 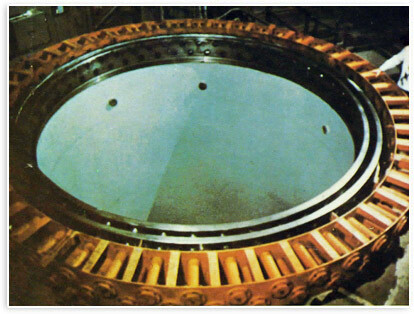 Multiple shear loading of the radial pins provide more area to withstand pressures; therefore, the required size and number of pins are minimized. Because the Hahn & Clay finger-pin principle places the forces at the closure in a straight line, similar to a welded connection, the size and weight of the closure is greatly reduced. The finger-pin principle extends closure limits far beyond those practical with bolts.